I have noticed cracking at the corners of my mouth, they won’t go away. What is it and what should I do? 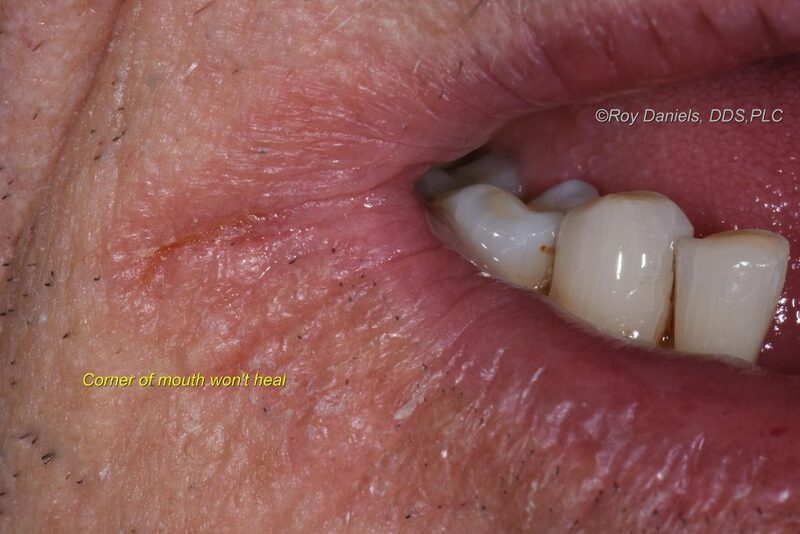 Do you have a painful, red sore at the corners of your mouth? Have you tried rubbing on chapstick and it doesn’t do the trick? The culprit may not be chapped lips. You could have a skin condition known as angular cheilitis. Angular cheilitis is often mistaken for a cold sore or chapped lips, but it’s usually caused by a fungus. Licking your licks excessively can contribute to angular cheilitis. Cracking of the corners of the mouth is a common condition that is frequently seen in both the offices of dermatologists and dentists. Angular cheilitis is a skin condition that can cause one or both corners of the mouth to become painful, inflamed and sore. Often mistaken for “a cold sore in the corner of my mouth” these cracked corners may extend onto the lips or skin of the face slightly, but it is primarily confined to the corners of the mouth. The causes of Angular Chelitis are usually associated with infectious organisms including Candida albicans. Worn dentures that allow the chin and nose to be closer together. People with malocclusion or ill-fitting dentures should see a dentist. With time, ill-fitting dentures can promote bone loss which will eventually worsen overlapping of lips and create a more favorable atmosphere for angular cheilitis. Treatment should be customized to address the suspected cause/causes of angular cheilitis which may be a multifactorial condition in the individual patient. Dr. Daniels practice serves patients in Sedona, Cottonwood, Clarkdale, the Village of Oak Creek, Bell Rock dental and the Verde Valley area.